A personal loan is a financial tool you can use to help fund any personal need such as home maintenance, emergencies, education-related expenses, and even paying off credit card debt. With a fair credit score, finding a personal loan with reasonable interest rates may feel difficult, so we have broken down the best lenders for your credit profile below. EVEN Financial specializes in providing personal loans for all credit types, including fair credit. Their website provides a quick, free, and secure application that matches you to multiple trusted lending partners like OneMain Financial, Lending Club, Prosper, Avant, Rise, LightStream, Social Finance, Vouch, and Upstart. EVEN's lending partners provide your loan funds via direct deposit, so you may receive money as soon as the next business day. LoansUnder36 connects interested borrowers to a network of 100+ reputable personal loan lenders that cater to customers with any credit score -- even fair credit. They do exactly what their name suggests by only offering personal loans with interest rates under 36%. With a quick and 100% free LoansUnder36 application, you can compare multiple loan offers. You are under no obligation to choose a loan, which allows you to go over all the loan terms before making a final decision. Monevo specializes in loans for borrowers with fair to excellent credit. Their online loan marketplace serves customers in both the UK and the United States. Their application is quick and free to fill out and allows you to choose your desired loan amount, loan term, and the purpose of your loan. Monevo's award-winning technology forwards your information to their lending partners to see if they have any real-time, no-obligation loan offers that match your needs. Once you receive your loan offers, you can compare them through an organized table and decide on the best loan for you. Upgrade offers unsecured personal loans with fixed interest rates for borrowers with fair to excellent credit. Their application process is done entirely online. To see your potential interest rates, you must visit Upgrade’s home page, enter your loan amount and the reason you want to borrow, and click on "Check Your Rate." You then submit your personal and financial information before Upgrade either shows you multiple loan options or notifies you that your application has been denied. Once you have chosen and agreed to your loan terms, Upgrade performs a hard credit check and verifies your bank account information before directly depositing your cash within the same business day. They should never ask you to pay upfront fees. You shouldn't be required to pay a fee during the application process to check your credit report. Lenders can't make any guarantees. No reputable company can guarantee that you will qualify for a loan before the application process, since they must check your financial information, loan application, and receive proof of income before approving a personal loan. You should be the one taking the steps to contact a lending company. Lenders should not be aggressively contacting you through phone, email, or mail to take out a loan. Online applications are simple. Borrowers only have to enter some basic personal information for the two online applications for the pre-approval process and the formal application. Lenders will perform a soft pull on your credit report during the pre-approval process, which lets you compare your loan offers without any hard inquiries damaging your credit. When you decide on the best loan terms for you, you can fill out the remainder of your personal information on your specific lender's application. Most lenders authorize a hard pull before approving your application but you can also check the lender’s policy on credit report pulls before you apply. You must meet your lender's minimum credit score requirement: The majority of fair credit scores range between 580 and 660. Many lenders may also have no minimum credit score requirement. You must have a steady stream of income: A regular source of income greatly increases your chances of approval. What Are Some Benefits Of Online Loans? You receive your funds quickly -- sometimes in as little as one business day. Most loans have fixed rates, so you don’t have to worry about the rates changing over time. Most of the loans are unsecured and don't require any collateral. Personal loans can be used for any purpose. Most personal loans don’t have any prepayment penalties for paying off your loan early, which can help reduce your interest in the long run. If you take out a credit builder loan, you can use that to improve your credit through on-time payments. What Are Some Signs Of A Reputable Lender? Online transparency: Reputable lenders list their fees, APRs, and additional terms on their website. Compliance with state regulations: You can see if they are registered in your state by contacting the state’s financial regulatory bureau. Credit bureau reporting: Check to see if your lender reports to the three major bureaus (Experian, Equifax, and TransUnion). Should I Apply For Multiple Loans To Get The Best Rates? You should avoid applying for multiple loans in the same time period since this can damage your credit. Additionally, many lenders see this as a bad sign in a prospective borrower. What If The Interest Rates Are Too High For Me? Although it is difficult to qualify for a low-interest personal loan with fair credit, there are lenders who cater to your specific situation. You may also opt to put up your savings or a car as collateral to qualify for a secured loan. What Can I Do About My Credit So I Can Get A Better Loan? 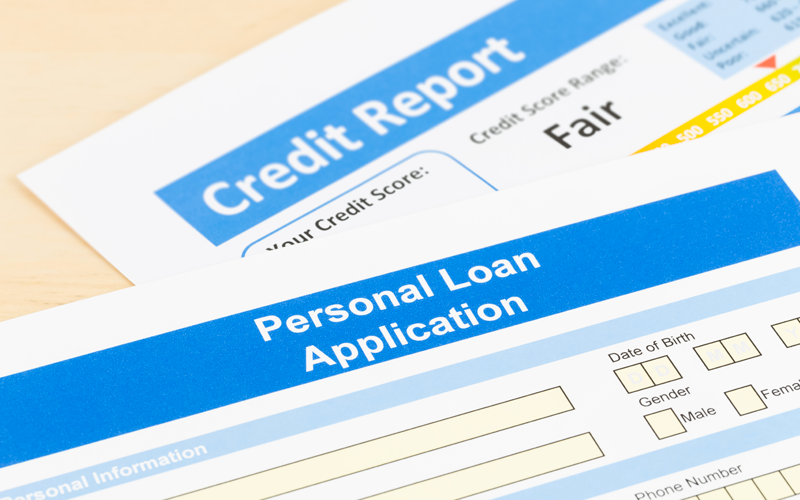 When it comes to personal loans, your credit history plays an important role in determining your interest rate. Check your credit report for inaccurate or unverifiable items: If you find any, you can dispute it on your own or by using a credit repair service. You can obtain a free copy of your credit report once a year at www.annualcreditreport.com. Use a credit-building tool: You can use a credit-builder loan (such as one from Self Lender) or a secured credit card to build your credit. Pay your bills on time: It sounds obvious but even a single late payment can damage your credit score. Pay your full balance: You want to avoid high credit utilization (your outstanding balance versus your total credit limit). Aim to keep your credit utilization below 30% and ideally under 10%. Keep your accounts open: Even if you have credit that you don’t use, keeping your accounts open improves your credit by showing that you have a long credit history.